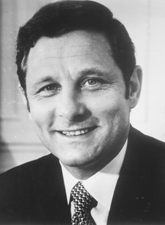 Four-term liberal Senator first elected in 1962, defeating Homer Earl Capehart. Key proponent of lowering the voting age to 18 and "Title IX" gender equality legislation. Contended for the Democratic Presidential nomination in 1976, losing to Jimmy Carter. Defeated for re-election to the Senate by Dan Quayle in 1980. Presently practicing law in Washington DC as a partner in law firm Venable, Baetjer, Howard, and Civiletti. His son, Evan Bayh, succeeded Quayle in the US Senate.